Ed Pien's "Staging" in the Kitchener City Hall Rotunda is best seen in the evening after sun down. We will be temporarily removing the work from the Rotunda on June 8 and will reinstall in it on June 10. 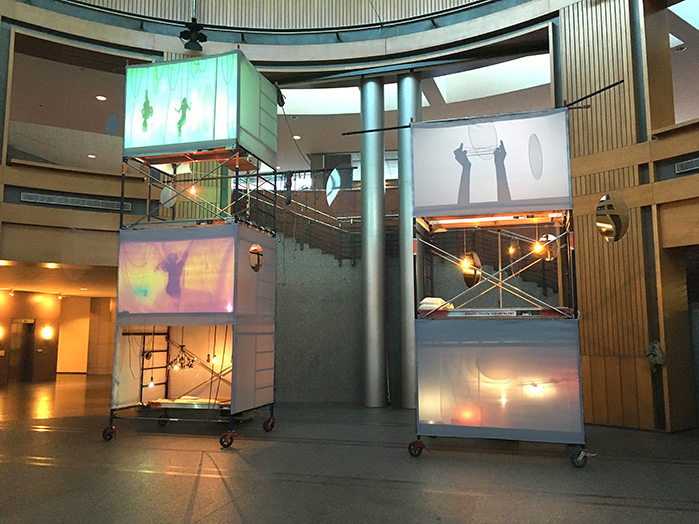 Staging is a large-scale installation realized specifically for the Rotunda of the Kitchener City Hall during CAFKA in 2016. Physically, this work comprises numerous scaffolds that are used as small modular theatre stages and spaces. Multiple installations using mirrors, ropes, lights, video projections and other diverse material will be set up within these units. The moving images and installations will help activate these units and draw viewers’ attention to the entire artwork. It is a work that reinforces the artist's interest in the playful exploration and mutation of time, space and place; as well as the blurring of illusion and reality. Ed Pien is a Canadian artist based in Toronto. He has been drawing for nearly 30 years. Born in Taipei, Taiwan, he immigrated to Canada with his family at the age of eleven. He holds a Master of Fine Arts degree from York University in Toronto and Bachelor of Fine Arts degree from the University of Western Ontario, in London, Ontario. Ed Pien has exhibited nationally and internationally including New York, La Biennale de Montreal 2000 and 2002, Amsterdam, Vancouver, United Kingdom, Mexico, Berlin, Liverpool, Toronto, and the National Art Gallery of Canada, Ottawa. As an art instructor, Ed Pien has taught at the Emily Carr Institute of Art and Design, Nova Scotia College of Art and Design and the Ontario College of Art and Design. He currently teaches part-time at the University of Toronto.Pien is represented by Birch Libralato in Toronto, Pierre-François Ouellette Art Contemporain in Montreal and Galerie Maurits van de Laar in The Hague. Curated and produced by CAFKA.